RACINE, Ohio — Tornadoes can still slice through rainstorms you know. At least the Southern Tornadoes did on Friday night. Host Southern amassed 272 rushing yards and six on-the-ground touchdowns, and pitched a convincing 41-0 shutout of the Frontier Cougars in a non-league football game inside soggy Roger Lee Adams Memorial Field. With the win, the Purple and Gold improved to 2-0, while the young Cougars — after a 1-9 campaign a year ago — fell to 0-2. 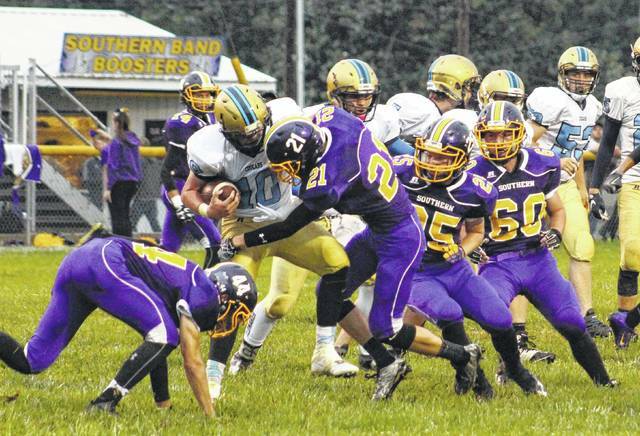 The Tornadoes, despite five fumbles largely due to the slippery surface from Friday’s rain, did pretty much what they wanted to do — and that was to run the ball. Southern’s top two backs — Dylan Smith and Riley Roush — carried 14 times apiece and combined for five touchdowns, as Reece Reuter scored on a 1-yard plunge with 10 minutes remaining to round out the scoring. Roush rushed for 105 yards and a hat trick of TDs — as he had the first three scores with all coming in a span of 14 minutes and five seconds. He had scoring runs of five, four and 35 yards, while Smith — almost 12 minutes apart — tacked on his paydirt trips of two and 15. Smith outrushed the Cougars by himself, amounting 146 yards with some of his biggest gainers going late. Southern led 12-0 midway through the first quarter, as Smith’s 2-yard dive and Roush’s extra-point run made it 26-0 with three minutes to play in the second stanza. Smith’s 15-yard run and subsequent two-point conversion run made it 34-0 in the third period, as Andrew Evans added the extra-point kick for the 41-0 final. In fact, for the final 15 minutes and 37 seconds, the Ohio High School Athletic Association running-clock rule went into effect. However, the Tornadoes’ constant on Friday night was indeed their defense, which stymied the Cougars to a mere two yards per carry (66 yards on 33 attempts). Frontier finished with just 70 total yards, and lost all six of their fumbles while committing seven total turnovers. It’s hard to be better defensively, though, than with a shutout. Southern also forced Frontier into three punts — the final two of which were three-and-out possessions in the second quarter. The Cougars had just two drives of at least seven plays, as all seven of their drives which resulted in turnovers consisted of four plays or less. Speaking of seven, Frontier failed to reach midfield on its opening seven possessions — and only found itself in Tornado territory thanks to a lost Southern fumble and a 15-yard face mask penalty on the final official play of the first half. In the second half, the Cougars crossed midfield on their opening series to the 49-yard line, but turned the ball over on downs — and never got to their own 40 on any of their final three drives. The Tornadoes held a 15-5 advantage in first downs, as Frontier did complete one pass for a mere four yards. Southern completed its only pass of the game on its fifth play from scrimmage, but the rollout completion from quarterback Logan Drummer to wideout Weston Thorla went for 15 yards and converted 3rd-and-9. Roush, just two-and-a-half minutes in, scored the only touchdown the Tornadoes needed from five yards out to make it 6-0. After Smith intercepted Frontier starting quarterback Eric Tidd, and returned the ball 25 yards to the Cougar 30, Smith sprinted 17 yards to the 13 — before Roush scored from four yards away at the 6:45 mark. Finally, Roush raced in from 35 yards with 9:55 left before halftime — offsetting two Tornado turnovers as the Cougars fumbled twice and punted once following seven plays. By that time, a brief but hard downpour had hit — but the Tornadoes’ damage had already been done. “We knew we were going to have to establish the run. We were hoping to score early just because we knew the field conditions would continue to deteriorate. I thought our kids did a nice job for the most part, and our effort was definitely there,” said Chancey. Following Frontier’s third lost fumble of the half, Southern scored again thanks to Smith, who carried three times for 40 yards, including for 36 yards to set up his 2-yard TD. Roush’s extra-point run made it 26-0 at the three-minute mark. Tidd, who was injured on the final official play of the half, did not play on offense in the second —as Lane Snyder completed the Cougars’ only pass. 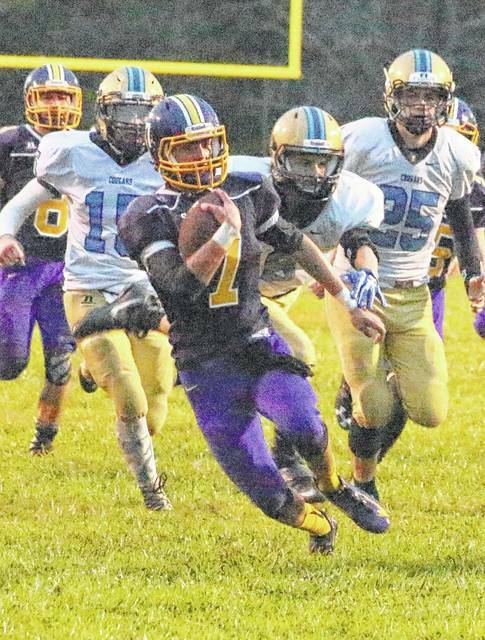 The Tornadoes return home, and open Tri-Valley Conference Hocking Division action, on Friday night against Wahama. The White Falcons lost to Waterford 27-0 in their TVC Hocking opener, and dipped to 0-2 in the process. Southern junior Austin Baker (21) takes down a Frontier ball carrier during the first half of Friday night’s Week 2 football contest at Roger Lee Adams Memorial Field in Racine, Ohio. Southern senior Dylan Smith (7) breaks away from a trio of Frontier defenders during the first half of Friday night’s Week 2 football contest at Roger Lee Adams Memorial Field in Racine, Ohio.